His philosophy was for the most part Tory irritability exploding in ridicule, but Peacock was one of the most lettered men of his age and his flouts and jeers smack of good reading, old wine, and respectable prejudices. This from that insomniac’s friend, the Eleventh Edition of the Encyclopedia Britannica — from the “English Literature” entry in Volume IX. But I felt there still was a difference between then and now. Last night’s 4 a.m. reading reminded me of what it was…. That’s poetry, that is, guv’nor. 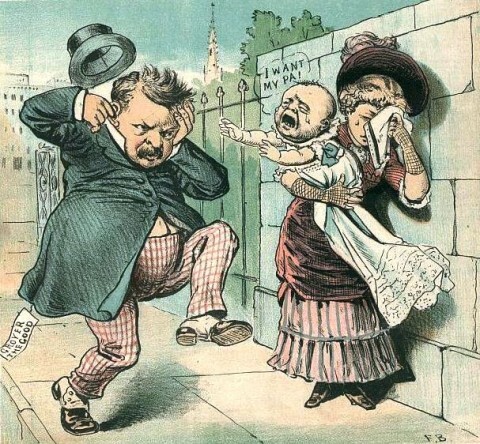 Image: The Judge magazine, “Another voice for Cleveland,” political cartoon in the 1884 campaign, referencing the rumors Grover Cleveland had sired an out-of-wedlock child. This entry was posted on October 30, 2013 at 1:13 pm and is filed under Brain bubbles, good writing. You can subscribe via RSS 2.0 feed to this post's comments.